Canlendula is an aromatic plant native to the Mediterranean. Grown as a garden flower, it blooms once a month, usually at the new moon. Since it blooms by the calender, that is where the name orginated. The flowers are used in herbal medicine to make creams, ointments and washes. The plant is a derivative of the marigold flower and looks similar to certain species of chrysanthemum. As a medicinal treatment, it is and antibacterial, anti-inflammatory, and a pain killing agent for minor injurites, topical infection and irritation. It is available in creams, eyedrops, teas and tinctures. Compounding pharmacies may offer a combination of calendula and comfrey. Creams are widely used in Europe for skin rash such a diaper rash, sunburns and insect bites. It is very easy to make a wash of this herb. Generally, a 2-5% ratio is recommended when making an infusion which can be used in dermatitis or dandruff. About one tsp in 8 oz of water should be effective enough. For dermatitis, a cream may be a little more effective. A tincture is a bit different. This is when the herb is distilled in alcohol until a concentration solution results. Usually this contains about 10% of the herb. Here is full information about herb product types. This is one of the nice benefits of this herb, is that you can grow it in your garden organically, and then make your own preparations without worrying about chemical additives. Because of the cumulative nature of the antibacterial toxins, this herb should not be used longer than 2 weeks. Wait six weeks before resuming. The Journal of Clinical Oncology published a study in 2004 looking at the effects of a topical cream in radiation dermatitis. 254 patients who had already received surgery for breast cancer were put in one of two groups. The first group received Calendula topically and the second received trolamine which is a standard topical treatment for the dermatitis. The results showed that those in the Calendula group had less high grade dermatitis than thos in the trolamine group. The study recommended further trials to look at this question, but so far no large clinical trials have been conducted. Allergies. Helpful for food allergies, prevents overgrowth of yeast in the bowel, promotes digestion. Bowel diseases. Reduces inflammation causing pain, relaxes nervous constriction of digestive muscles. Conjunctivitis. Eye wash treats chronic conjunctivitis, stimulates growth of healthy membrane around eye. Gastritis. Prevents homonal reactions that produce inflammation of stomach lining, may help prevent H.pylori infections which is associated with ulcers. Skin disorders and wounds. The creams are used as additive in skin cream, which stimulates collagen production, fills wrinkles, hydrates skin. Radiation dermatitis. Effectively treats radiation dermatitis during breast cancer treatment. Otitis media. Drops are effective in treating pain in ear infections in children. Dandruff. Using the wash as a shampoo can reduce flaking, itching and help prevent dandruf. May have some benefit with psoriasis of the scalp. If taken internally it can increase the sedative effect of medications used for anxiety and insomnia. Use caution while driving or operating machines and taking calendula and sedative medications. Do not take orally if pregnant, but the creams can be used topically. It has been known to cause allergic reactions. If you are allergic to ragweed, chrysanthemums or daisies, you should not take this. The most common reaction is a rash on the skin. Preparations of this have been known to irritate the gallbladder if taken internally. 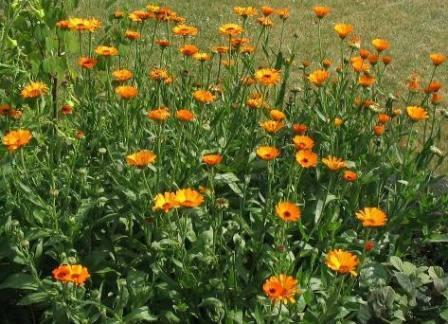 If you have a gallbladder condition do not take Calendula unless under the supervision of a doctor.